Water discharged from Dworshak Dam and Reservoir will fluctuate Thursday and Friday, April 28-29, as staff conduct testing of the Dworshak National Fish Hatchery's total dissolve gas (TDG) degassing equipment, according to U.S. Army Corps of Engineers water-management officials at the Walla Walla District. The testing is necessary to simulate unusual flow conditions which may occur next spring while the Corps performs a major overhaul of the Corps' largest hydroelectric generator. Unit 3 will be out of service and unable to pass water from the reservoir Sept. 1, 2016, through May 1, 2017. The 220,000-kilowatt generator is capable of passing more water (5,600 cubic feet per second) through the powerhouse than Units 1 and 2 combined (4,800 c.f.s.). Having Unit 3 out of service during the 2017 spring-thaw season presents some unique challenges. Regional water managers strive to balance flows from the reservoir into the North Fork-Clearwater River to meet flood-risk-management needs while keeping total dissolve gasses in the water below 110 percent. High TDG levels can cause gas bubble trauma in fish. TDG production at the dam varies based on a combination of factors -- discharge methods (through hydropower turbines, spillway gates or release outlets), environmental conditions (air temperature, water temperature and atmospheric pressure), and dilution. 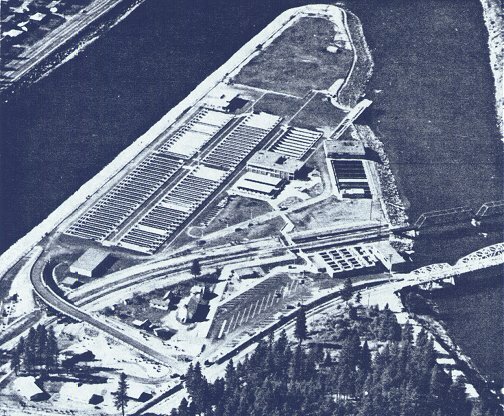 Dworshak National Fish Hatchery, located about 1.3 miles downstream of Dworshak Dam, is of special concern. The hatchery produces ESA-listed steelhead and salmon smolts and pumps most of its water supply from the North Fork. TDG production from Dworshak Dam is measured at the hatchery intake to allow for in-river mixing from different sources of water. The hatchery's degassing equipment was recently upgraded from packed column to vacuum column degassing, significantly improving the efficiency of the degassing operation. The new equipment has yet to be evaluated under high TDG conditions, making the data from this scheduled testing of considerable value to hatchery managers. "This testing will enable us to make better-informed decisions about how to manage discharges next year to minimize TDGs without Unit 3 being available," said Steve Hall, Walla Walla District's senior water manager. "The information we gather will also give the hatcheries good data about the performance of their equipment and help them make decisions about their operations." Based on feedback received from the Technical Management Team -- an interagency technical group of federal, tribal and state members responsible for making recommendations on dam and reservoir operations to benefit ESA-listed fish species -- water discharges during the test periods are expected to operate at approximately 115- and 120-percent TDG while operating only generator Units 1 and 2. Testing is scheduled for 10 a.m. to 4 p.m. on Thursday and Friday using varying volumes of spill (total discharges between 9,000 -11,000 c.f.s. ), adjusted as necessary to achieve target TDGs necessary to evaluate the hatchery's degassing equipment. River levels at the confluence with the mainstem Clearwater River will fluctuate between one-half and one foot in depth during testing. Outside of testing times, discharge flows from the dam will remain at about 15,000 c.f.s. TDG will be measured during the test using water-quality-monitoring probes at the DNFH and several key locations further downstream, including the Big Canyon Creek Acclimation Facility, about eight miles downstream of the dam, and the Nez Perce Tribal Hatchery, located about 25 miles downstream of the dam.